At Robotics Association of Nepal, as engineers, we not only find the problems but also look for the creative solution to those problems. Be it an agricultural issues [DCDC 2015], or implementation of students’ invention [Innovation Center], or platform for robotics enthusiast and artists [Yantra Art, Science, Tech festival]. After #Nepal Earthquake, we identified communication and illumination as one of the major problem faced by Nepalese after food, clothing and shelter issue. To solve this problem, we have developed Solar Powered Light and Mobile Charger (SPLMC) which could support three mobiles and two 3W LED bulb at a time. The team of Robotics Association of Nepal had gone for survey on remote villages of Nuwakot District. According to the Local Development Office, Nuwakot, after Nepal was hit by 7.9 Richter scale, almost 80% of Houses of Nuwakot are destroyed. Mainly old houses made up of mud were highly damaged causing hundreds of death. Since then there is no proper supply of electricity in the upper hilly villages of Nuwakot. The locals of such areas have to spend 10 hours of walk for 2 hours of mobile charge to the headquarter of Nuwakot, Bidur and ain’t able to live with proper sight during night time. After the surveyon remote areas of Nuwakot district , our team went to Jiling V.D.C which is at the altitude of about 2100 km above the sea. It took us one and half hour bike ride from Dhamale to reach at the village area of Jiling through spiral gravel roads. Beautiful Jiling V.D.C was turned into cruel dust leaving 1000 of villagers homeless. Most of the villagers had dead mobiles waiting for our arrival to make it function again. Villagers shared they have been overlooked for rescue and relief operation as they weren’t easily accessible. Then, two systems were distributed in responsibility of Mr.Nabaraj Lama, social teacher of community school. We hope there won’t be suffocation for communication as villagers will be able to charge their mobile and sight stimulation can be fulfilled to some extent. After our announcement of #Light Of Hope Earthquake Relief Campaign, the needy persons are contacting us for the system supply. We have successfully deployed 204 “Solar Powered Light And Mobile Charger” station to following districts of Nepal in collaboration with Ghampower Nepal Pvt.Ltd.. We are also working with different relief teams like World Peace Earthquake relief Helping Hands, local relief teams like Bharat prasad Smriti Pratisthan in order to make our work efficient. 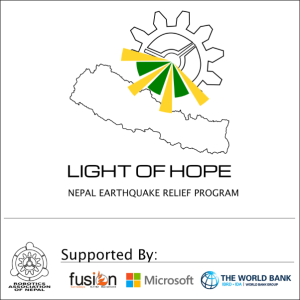 In this overwhelming distressed circumstance, we Robotics Association Of Nepal are trying our best to help the underprivileged villagers due to the geographical backwardness.